Brendan Gerdes, Emily Halter, Argie Mina, Garrett Fields, and Coach Richard Levin celebrate their Summit Cup victory. 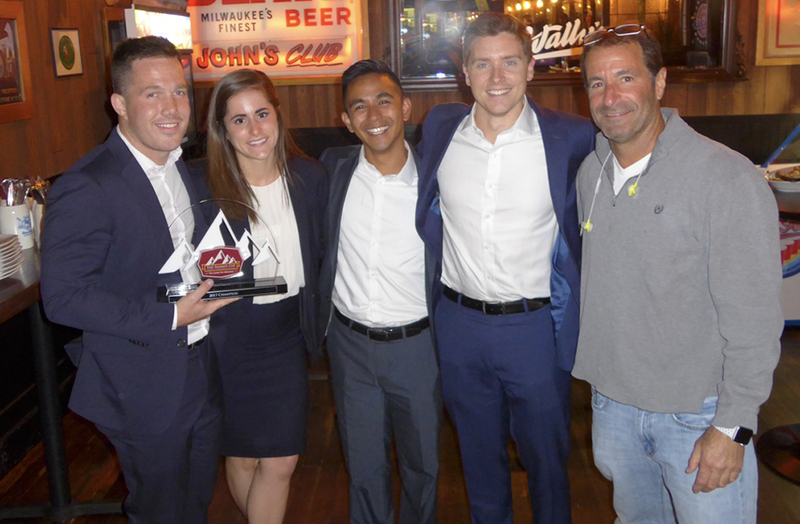 A team from Northwestern Pritzker School of Law’s Bartlit Center for Trial Advocacy won the Summit Cup championship, held at the University of Denver September 28-30. The University of Denver’s Center for Advocacy hosted the leading teams from around the country. The Northwestern Law team of Emily Halter (JD’18), Brendan Gerdes (JD’18), Garrett Fields (JD’18), and Argie Mina (JD’19) went undefeated in an invitational field comprising the top 12 trial teams in the United States. In the five rounds of competition, Northwestern defeated teams from Stetson Law School, Campbell University, the University of California, Davis, Florida State University, and American University. In addition, Fields and Gerdes were named the two best advocates in the competition. Steven Lubet, the Williams Memorial Professor of Law at Northwestern and director of the Bartlit Center, is the team’s advisor.